The Salvador Dali “brand” is constantly being tested. In June the Gala-Salvadora Dali Foundation won its battle against the Museo Dali Escaultor– which was promoting itself as the official Dali museum. Following a three year battle, the Barcelona court stated that the Museo was “misusing the Dali ‘brand’ and deliberately misleading consumers into thinking it was an official museum.” The decision is currently under appeal. This case created a precedent which the Gala-Salvador Dali Foundation hopes to use in future action against the producers of post-mortem Dali bronzes and others who exploit Dali’s image and “brand.” The decision reinforces the Dali Foundation’s control of “images, industrial property, trademarks, patents and other intangible rights deriving from the artistic oeuvre of Salvador Dali will it be promotion, development, dissemination, protection and defence of the artist’s image and artistic, cultural, intellectual and industrial work.” These rights were granted to the organization by the Spanish Ministry of Culture, which become the sole owner of Dali’s goods, rights and artistic creations upon his death on January 23, 1989 (Royal Decree 799/1995). In 1997, the Dali Foundation, along with the Visual Entidad de Gestion de Artistas Plasticos (VEGAP), organized a process for manufacturers to apply for authorization to reproduce Dali works. The Dali Foundation’s ownership of the Dali copyright and trademark became international by a Ministerial Order from the Spanish Minister of Education, Culture and Sport in 2001. The next target for the Dali Foundation may be Beniamino Levi, who markets bronzes produced at Yongheng Craft Manufacturers in Beijing. His bronzes sell on E-bay and other online retailers for US$1,200- $4,000. In November 2010, Levi sold Space Venus dated 1977-1984 for US$141,790 at Hong Kon’s Est-Ouest Auction Company. 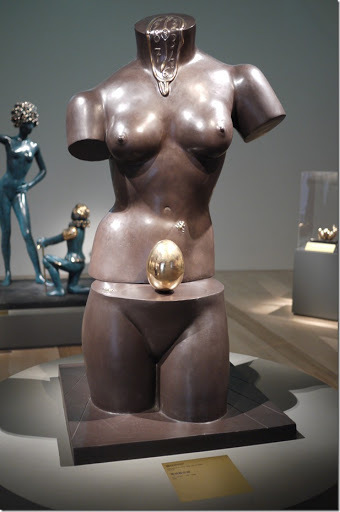 Levi’s lawyer, Lawrence Fox of McDermott, Will & Emery, denies contact with the Dali Foundation. Levi claims the right to reproduce these bronzes from contracts sold by the Dali Foundation itself. Some of these contracts might originate from Dali’s wife, Gala, who sold several rights of reproduction before her death for one-time cash payments. Levi has copyrighted 29 sculptures, 19 two-dimensional images and two Dali signatures in the United States. Levi purchased additional rights from Dali’s business manager, Enrique Sabater. In 1980, Sabater purchased these rights and one of Dali’s signatures from the Dali Foundation directly. In these murky waters, authentication of a true Dali bronze is almost impossible. Sotheby’s has issued a statement that they only sell pieces authenticated by expert Nicolas Descarnes, who is the son of Dali’s confidant and business manager. There is not an accurate or up to date catalogue raisonne of Dali sculptures, which often means that a provenance trail for works is often nonexistent.